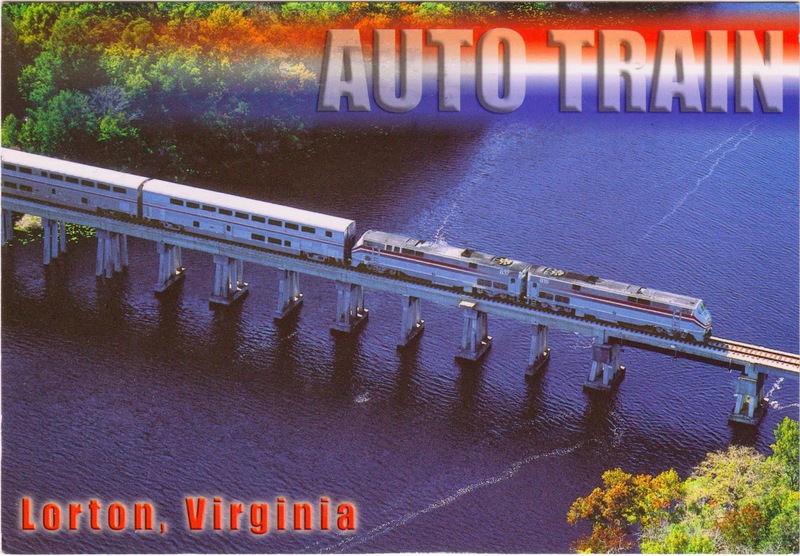 Postcard US-2690034 from Florida shows that Auto Train, an 855-mile or 1,376-km scheduled service between Sanford, Florida near Orlando and Lorton, Virginia near Washington D.C. by Amtrak, transports passengers AND their cars. Trains depart daily at 4:00pm and arrive at the destinations at 9:30am next day. It is the only one of its kind in the US. When I was a graduate student living in the east coast, I had chances to take the train. However, I ended up passing the opportunities, as the cost of driving was considerably lower when the gas costed lesss than two US dollars and if wear and tear of the car was not factored in. However, with the current average gas price at $3.50, an one-way trip from Orlando, Florida to Washington D.C. would take almost 12 hours and cost at least $120 using AAA's fuel cost calculator. In comparison, a least expensive one-way Auto Train ticket from Sanford, Florida to Lorton, Virginia on April 15, 2014 would cost $102 for a passenger plus $186 for an automobile or $131 for a motorcycle. While the fare is complex just like airlines ticket and not inexpensive, it may be worth a try just to eliminate stress from the 12-hour driving. Labels: Amtrak, Auto Train, automobile, car, Florida, fuel cost, gas, Lorton, Orlando, passenger, postcard, PostCrossing, received, Sanford, ticket, train, US-2690034, Virginia, Washington D.C.